It is no coincidence that lights are a core component of Hanukkah, Christmas, and Kwanzaa. The most famous debates of Jewish law throughout history occurred between the students of Hillel the sage and the students of Shammai the sage. And of those famous debates, the one most often discussed case involves the lighting of the Hanukkah candles. The students of Shammai argued that the first night of the eight day festival Jewish people are commanded to light all eight candles of the menorah and then remove one additional candle with each successive night. This, they reasoned, would show that our joy is diminished as the festival goes on. The students of Hillel, on the other hand, argued that we begin lighting one candle and then add an additional candle each night until the menorah is burning bright with eight candles on the final night. This shows that our joy increases throughout the holiday. The Jewish tradition of lighting Hanukkah candles follows the school of Hillel. And I’m glad my ancestors ruled the way they did. The increase of light is a beautiful metaphor not only for this dark time of year, but for these dark days in our nation. The warm glow of the menorah we place in our windows for all to see demonstrates our determination to bring much needed light into our communities despite the unrest among us. For this reason, another name of Hanukkah is the “Festival of Lights” and Judaism is not the only religion seeking to bring light into this dark world. 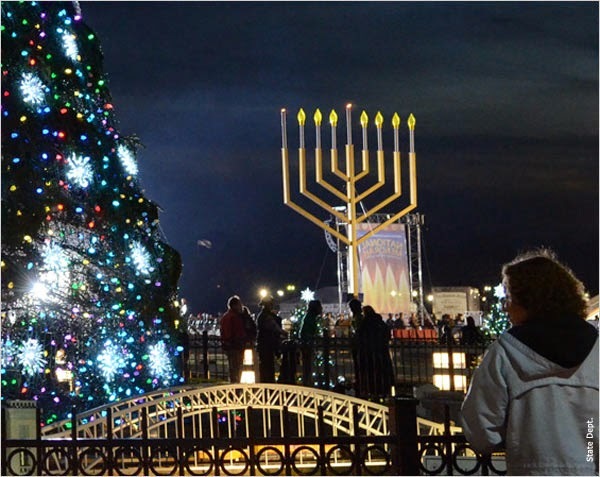 It is no coincidence that lights are a core component of Hanukkah, Christmas, and Kwanzaa. Each of these three religious holidays occurs around the winter solstice when the days are the shortest and our nights become darker earlier. Like the lighting of the Hanukkah candles, the lighting of the Kwanzaa candle also seeks to bring light into a dark world. Streets are brighter during this winter holiday season as those celebrating Christmas light Advent candles and string bright, colorful lights atop their trees and houses. The dedication to light as a metaphor during the cold, dark months is not even limited to only those observing Hanukkah, Christmas, or Kwanzaa. Diwali, the Hindu festival of lights, was celebrated this past October by Hindus, Jains, and Sikhs. Additionally, the Zoroastrians celebrate the winter solstice with their holiday of Yalda. I am always with Hillel the optimist and less strict of the Hillel- Shamai (בית הלל ובית שמאי) rivals and I am glad that his opinion regarding the lighting of the Chanukiyah prevailed. As Jews, history taught us that there is hope, we are the best proof of it, we are still here lighting our beautiful Chanukiyot one more candle each night. May we do it again next year and may it be less dark outside. But no matter what, the great light emanating from our many Chanukiyot will prevail,again. 1. In the original miracle, 1/8 of the oil was consumed each day, so amount of oil remaining in the menorah decreased each day, so we decrease our lights each day. 2. Chanukah is compared to Sukkot. The sacrafices for the holiday of Sukkot decreased each day (13 bulls the 1st day, 12 the 2nd day, etc. ), so we decrease the lights each day, similar to the sacrafices of Sukkot. You said "they reasoned, would show that our joy is diminished as the festival goes on"
I had never heard or seen this reason before! Perhaps the students of Hillel said that our joy increases, but that does not necessarily imply that the students of Shammai said the opposite. Perhaps they agreed that our joy increases, but the other reasons are more compelling when deciding how to implement the actual practice of lighting.